Netflix just announced the young actors who’ll be starring with Winona Ryder and David Harbour in Stranger Things. 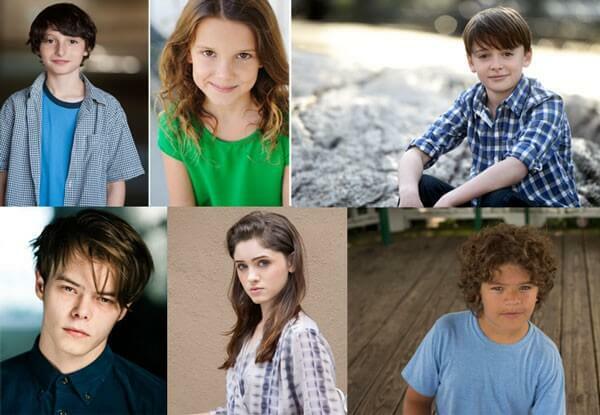 Joining the cast after an extensive search are Finn Wolfhard, Millie Brown, Gaten Matarazzo, Caleb McLaughlin, Noah Schnapp, Natalia Dyer and Charlie Heaton. The one hour dramatic series comes from writer/directors Matt Duffer and Ross Duffer (Wayward Pines) and will premiere sometime in 2016. Season one will consist of eight episodes. Described as an ode to ’80s classics, the dramatic series will be set in Indiana. Stranger Things follows the story of a young boy who seemingly vanishes without a trace. “As friends, family, and local police search for answers, they are drawn into an extraordinary mystery involving top secret experiments, terrifying supernatural forces, and one very strange little girl,” according to Netflix. Winona Ryder will portray Joyce, a working class single mother reeling from the disappearance of her 12-year-old son, and David Harbour will play the town’s chief of police. Finn Wolfhard co-stars in the series as Mike, a bullied 12-year-old who becomes an unlikely hero in the quest to save his best friend. In the series, Millie Brown portrays a mysterious character that Mike meets in the woods, who possesses strange abilities. Gaten Matarazzo joins the cast as Dustin, a 12-year-old who marches to the beat of his own drum and whose sense of humor helps defuse tense situations in the series. Caleb McLaughlin stars as Lucas, an opinionated friend of Mike’s, who possesses a fierceness and courage the other boys lack. Noah Schnapp portrays Will in the series, a small and sensitive boy who doesn’t fit into the 1980’s definition of normal, who vanishes into thin air. Natalia Dyer portrays Nancy in the series, Mike’s teenage, older sister. Charlie Heaton portrays Jonathan, Will’s older teenage brother.